The Nikon 1 J3 is the brand's latest compact system camera but does it bring enough to the table to compete with its rivals? 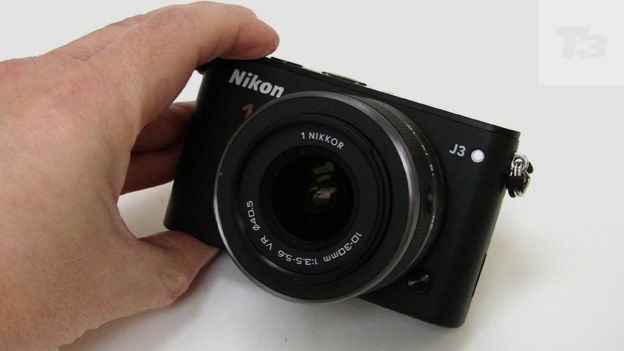 The Nikon 1 J3 is the brand's newest entry-level CSC, coming after last year's Nikon 1 J2 and the Nikon 1 J1 the year before that, which ultimately became the UK's top selling CSC. So what's different this time around, and has Nikon done enough to stay on top? Want to start experimenting with interchangeable lenses to achieve more pro-looking pictures, but don't want SLR-type bulk? Announced at the start of the year along with the cheaper 10.1 megapixel Nikon S1 compact system camera, the Nikon 1 J3 is the fourth of Nikon's '1' compact system models released within the last six months. The range also also includes the previously reviewed J2 and V2 variants. Like the J2 and S1, the aluminium bodied J3 is an entry-level, family-friendly option pitched at upgraders, but features the same 14.2-megapixel resolution as the top-end V2 - if not that pricier model's enthusiast-pleasing extras, such as a built-in viewfinder. That increased pixel count is an on-paper improvement over the 10.1MP of its J1 and J2 predecessors, even though 13.2x8.8mm sensor dimensions and type (CMOS) remain the same on the J3. That means the chip is physically smaller than the DSLR-type APS-C sensors now used in rivals like the Canon EOS M, Samsung NX210, Sony NEX-6 and Fuji X-E1, generally perceived to offer better picture quality. However, improvements on the J3 include operational speed, giving rise to up to 15 frames per second continuous capture for example, while maximum light sensitivity has risen to ISO6400, a step on from the max ISO3200 of the J2. For this revamp Nikon has also been able to subtract a few millimetres and grams from the overall dimensions and body weight compared with the J2, not that you'd know without seeing it written down, as both cameras appear very much peas from the same pod. Unsurprisingly though, the J3 is some £80 more expensive than the J2 at a suggested £579.99 all in when bundled with a compact 10-30mm kit zoom. Alternatively a double zoom kit, which adds a 30-110mm, to provide the most comprehensive array of framing options, comes to £719.99. So how do J3 and lens handle in practice? Save for the Pentax Q and Pentax Q10, plus the maker's own Nikon S1, it may be one of the smallest CSCs available, but does that make it one of the best? The J3 retains the minimalist, almost futuristic looks of its J1 and J2 predecessors, with soft rounded corners and an almost featureless faceplate - apart from the actual Nikon 1 system lens mount of course, requiring our investment in a present handful of directly compatible Nikon-only optics. Or alternatively a £230 FT1 adapter that provides the opportunity of fitting larger optics originally intended for Nikon's DSLRs. In keeping with the J3's smallish form factor, controls appear pared back, refined and on occasion almost hidden. The on/off and video record buttons are set level with the top plate so as not to break its clean lines, whilst the shutter release button is only marginally raised to enable your forefinger to find it. There is a built-in pop-up flash this time around, but that too is set level with the top plate so it's disguised when inactive. The button provided for raising it, hidden at one side, only works if the camera is actually switched on. As with the earlier J2, the J3 can be activated or switched off by either extending or retracting the zoom lens barrel, which is a neat feature. In practical terms this meant we were able to turn on the camera and line up our first shot in one continuous (thus time saving) movement. In its inactive state the lens is retracted and has a locking button to keep it in place. This is in order that camera and lens combined retain the slimmest profile for easiest transportation. Though it wouldn't fit in the pocket of our jeans, the J3 and kit lens would nevertheless be a fit for most baggy jackets. This enabled us to use the J3 for unobtrusive shoot-from-the-hip street style photography, which this class of camera excels at, as it doesn't immediately mark you out as a pro or paparazzi when you whip it out. One of the most important controls on the J3 is the shooting mode dial. Its location, partially sticking out at the back edge of the top plate, allows its five settings to be accessed via a thumb spin. As on the J2, included here are a gimmicky Motion Snapshot effect that 'animates' a still by recording a one second video snippet alongside it and adding a little musical flourish when replayed in-camera. Next along on the dial we get a 'best moment capture' option, whereby the camera will take a quick burst of images and select for you the one it deems the, um, best. Next up is the self-explanatory standard Auto mode. Last on the dial are a Creative mode plus a dedicated 'Advanced movie' mode. It's possible to access the extended range of options provided by these last two shooting modes with a press of an easy-to-miss 'F' icon. Rather than being given its own button as on the J2, here it's been incorporated into the top edge of a multi directional command pad. In Creative mode we find dedicated Program, Aperture Priority, Shutter Priority and Manual modes - usually given their own space on a shooting mode dial - but instead here squirreled away, presumably so as not to distract less experienced shooters trading up from a smartphone or basic snapshot camera. We are also given various pre-sets for common scenes and subjects that would usually be classed as 'scene modes'. Again rather hidden away at the end of a list are the now ubiquitous easy panorama and miniature digital effect modes, the latter reducing buildings to a toy town-like scale. Nikon has made a point of trumpeting that the J3 (along with the equally new but even more stripped back S1) are its fastest CSCs off the block, and, in practical terms, a half squeeze of the shutter release button and the camera determined exposure and its auto focus point (or more likely points plural) in less time than it took us to blink. Squeeze the shutter release button down fully to take the shot and, accompanied by a sampled shutter noise that sounds suspiciously like someone spitting, this also appears instantaneous. Luckily, the above combination makes it highly likely that we'd be able to achieve the image we saw in our mind's eye before squeezing the trigger. Whilst the J3 might not have a DSLR-sized sensor then, this nevertheless offers DSLR-like speed in compact form, even if we'd have preferred access to some of its key settings to have been a bit less obtuse. Whereas the fixed 3-inch LCD screen used for shot composition and review at the rear of the J2 had its resolution boosted from the 460k dots of the J1 to a new high of 921k, Nikon sticks with that new benchmark for the J3. Those who like shooting with a camera at eye level, however may baulk at the fact that there's neither an electronic or optical viewfinder built in - as found on the range-topping Nikon V2 - nor any means of attaching one. In keeping the J3 compact and fuss free, Nikon has sacrificed a top plate hotshoe or accessory port for extras, such as found on the Olympus Pen, Sony NEX, Panasonic Lumix, Samsung NX and Fuji X ranges. With the Nikon 1 J3, it really does seem all about the convenience of a small and stylish form factor, and operation that is almost as easy as pointing and shooting with a smartphone - and admittedly many will like the fact that what you see is, for the most part, what you get. Unlike a smartphone though, and also unlike an increasing number of CSC rivals, the screen here isn't a touch screen. The Nikon J3 comes supplied with a mains battery charger out of the box, plus an EN-EL20 lithium ion rechargeable pack for the camera itself - the same as that supplied with the J2 and J1 before that. That delivered 70 minutes of Full HD video or 230 still photos. The amount of still photos able to be shot before juice runs out remains the same as on the J2, but video duration drops down to 50 minutes if shooting at the highest possible frame rate of 60fps, and at maximum Full HD movie resolution. This is, as with the previous model, an acceptable though less than ground-breaking performance. It's comparable with the sort of performance you'd get from a £200 snapper from which the potential J3 owner might be upgrading in fact. Like its J1 and J2 forebears, the J3 offers up Full HD 1920x1080 pixels resolution video with stereo sound - which as we've noted in previous write-ups isn't always the case with an entry-level model. While the manual operation of the lens barrel means we don't pick up any noise of lens motors on the soundtrack, only single as opposed to continuous auto focus is offered in video mode. This means that if you swap subjects mid recording, it's best to set the camera to manual focus to be able to adjust what you're focusing on yourself. Again though, as with most competing CSCs, save for the Olympus Pen range, there is no image stabilisation/anti shake built into the camera body, so opting for lenses with the feature - look for Nikon's 'VR' (Vibration Reduction) optics - is even more essential. Particularly since lenses with longer focal lengths - and especially so any larger DSLR lenses attached via adapter - result in a front heaviness. The supplied 10-30mm lens is fortunately a VR lens, and, because that focal range isn't particularly broad, it works as a starter option in conjunction with the camera, though a compact prime lens would be a better overall match still. We've criticised still image results from Nikon's 1 system models in the past as being, at worst, little better than what we'd expect to achieve from a point and shoot with bog standard 1/2.3-inch chip; flat, lacking in contrast and so rather short of DSLR-like quality. The same is true of Pentax's competing and even smaller 'Q' series CSC range. Some might take the more positive view however that the portability of the Nikon system enables photo-taking opportunities that wouldn't be attempted with a large DSLR or bigger CSC. So if, occasionally, we do get the odd soft shot, it's a sacrifice worth making. As with most cameras, pictures got softer the closer we were to maximum telephoto setting. Alternatively, at extreme wide-angle setting there is an ever so slight fisheye effect, better hidden when shooting natural subjects than man made ones. The maximum f/3.5 aperture provided by the 10-30mm kit zoom is, however not especially bright/fast, so like most snapshot cameras the J3 would really work best with lots of available natural light; a good portable holiday camera in other words. But ultimately no match quality wise for the likes of a Canon EOS M or Sony NEX-6 at a couple of hundred quid more. While the J3 has delivered four more million pixels in resolution over the J2 (and the newer S1), as when we compared the J2 to the original J1, the J3 comes across as more refinement - or rather consolidation of market position - than revolution. The tweaks here are largely in terms of operational speed, boosted ISO and that headline resolution, which in fairness on screen doesn't make a massive difference, as mentioned. We still don't get the smartphone-apeing features now being included on some rivals, such as touch screen control, Wi-Fi connectivity, angle adjustable rear screen, or even an Android operating system, such as found on Samsung's Galaxy Camera or Nikon's own Coolpix S800c snapshot - which might really have made the J3 a camera that stood out from the crowd. Keen amateur photographers might also grumble about the lack of means of attaching any optional viewfinder or flashgun for improved results, and the fact that manual control is hidden away within menu screens. But, more positively, in reducing the form factor and including a smaller sensor than enthusiast targeted rivals, Nikon has produced one of the most approachable CSCs straight out of the box. In conclusion, if you want all the mod cons, room to expand and the best image quality achievable from a CSC, look elsewhere. If you want convenience however, and one of the smallest form factors on the market yet one that also boasts a solid build, the J3 fits the bill.